Prescription opioid abuse is down among young people even as it continues grow among adults. Could more comprehensive addiction education be the catalyst behind this shift? NewsHour Extra education editor Victoria Pasquantonio sits down with Jennifer Fan, co-lead of the SAMHSA Strategic Initiative on Prescription Drug Abuse Prevention, and Brian Griffith, curriculum specialist with the Frederick County Public Schools to discuss how schools are educating students on the dangers of opioid addiction. Have questions? Drop them in the comments below. PBS NewsHour held a Facebook Live interview on Oct. 11, 2017 to discuss opioid education in schools with guests Capt. Jennifer Fan, policy analyst with the Substance Abuse and Mental Health Services Administration (SAMHSA), and Brian Griffith, curriculum supervisor for secondary health and physical education with Frederick County Public Schools in Maryland. While the misuse of opioid prescription pain relievers has skyrocketed among adults, the number of teenagers who misuse the drugs has actually continued to decline over the last five years. Heroin use by teens has substantially decreased since recent peak levels in the late 1990s, according to the 2016 Monitoring the Future survey released by the National Institutes of Health. The shift comes after hospitalization rates for prescription opioid use nearly doubled for children and adolescents between 1997 and 2012. 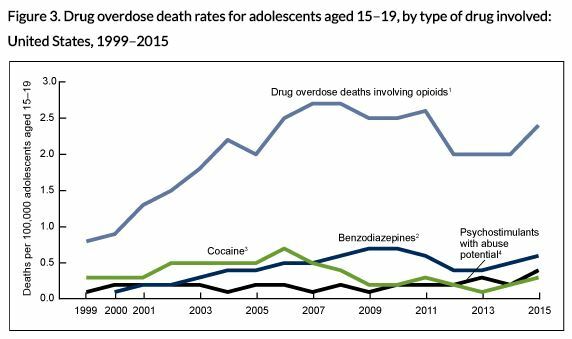 Opioid overdose deaths for those aged 15–19 increased from 1999 through 2007, then declined through 2014. In 2015, opioid overdoses increased again, resulting in the deaths of 772 young people. 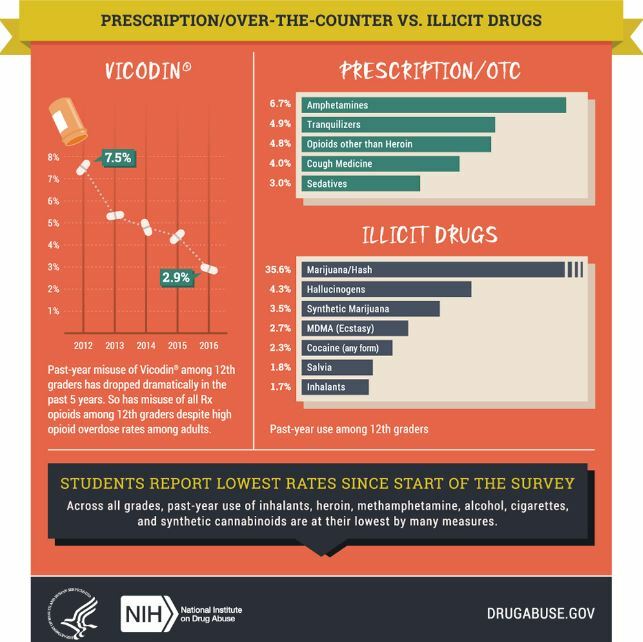 According to health officials at the National Institute on Drug Abuse (NIDA), several factors have played a role in this shift, including stricter prescribing practices and education programs that build students’ decision-making skills and teach them about the dangers of opioid addiction. Although many children and adolescents are legally prescribed opioid pain relievers after surgery or sports injuries, 54 percent of young people obtain opioids from a friend or a family member, according to Capt. Jennifer Fan, policy analyst at the Substance Abuse and Mental Health Administration (or SAMHSA), part of the U.S. Department of Health and Human Services. Teenagers misuse prescription opioid medicine to get high, to stop pain or because they think the drugs will help them with school work. In July, Maryland became one of the few states in the U.S. to require opioid education from third grade through college. The Start Talking Maryland Act also requires public schools to carry the overdose-reversal drug naloxone. Brian Griffith, curriculum supervisor for secondary health and physical education in Maryland’s Frederick County public school district, said that for him, a comprehensive approach to drug education works best, one that builds students’ skills like decision-making, goal-setting, self-management and bystander intervention. Schools should work with county health departments who can provide teacher training and resources on opioids that teachers can include in their curriculum, said Griffith. Griffith, who is in his 22nd year in phys ed and health education, also sits on a substance abuse council made up of key stakeholders in the county, including health officials, EMTs, members of the sheriff’s office and public school officials. Several studies, including a 2003 Government Accountability Office report, found that D.A.R.E. had been ineffective at preventing drug use among youth. In 2009, D.A.R.E. implemented and adapted a new middle school curriculum, “keepin’ it REAL.” The curriculum, based on the program developed by researchers at Penn State, focuses more on students’ decision-making skills rather than solely on drugs as D.A.R.E.’s original program had done. The keepin’ it REAL program did not address prescription opioids or heroin. D.A.R.E. plans to roll out an opioid-focused curriculum in 2018. Funding remains a challenge as state budgets have become smaller and smaller, Fan said. The federal grants that are available focus on naloxone training and “population prevention” treatment programs involving specific grades or high-risk groups. The Frederick County school system, which has been hard hit by the opioid epidemic, runs drug awareness campaigns like “Stay in the Know,” and “Take Back My Life,” which allows users and family members to share their stories about opioid addiction. The county also operates several drug-take back days, which lets residents safely dispose of expired prescription pain relievers. “Family is the primary educator,” Griffith said. “We know how important a healthy family dinner is where the TV is turned off and families actually communicate,” he said. Given long-established research that healthy children perform better academically, Griffith suggests that parents ask schools how much time they devote to the health of the child. SAMHSA’s Opioid Overdose Prevention Toolkit contains specific guidelines for parents to help them understand the impact of mental and substance use disorders on their children. Bystander intervention gives students the skills to intervene on behalf of a peer they feel may be in a harmful situation involving opioid abuse or bullying. Students learn to use resources within a school, such as a counselor or a teacher, to ask for help, according to Griffith. If someone you know is struggling with opioid addiction, you can call SAMHSA’s 24-hour national helpline at 1-800-662-HELP or www.findtreatment.samhsa.gov for free and confidential treatment referral information.